As it is the case with many prominent mountains, especially the ones with developed infrastructure, there are endless debates on what is “the true” ascent to Elbrus and what is not. You have to draw the line for yourself. Our approach was the following: we try to stretch and to do it our way and if we fail, we’ll train more and come back. You may have a different one. The “Normal” route (the South Side) takes about a week and starts in Azau/Terskol with the cable car + chair lift system. If the chair lifts are closed due to bad weather, you can hike up. Hike by itself is no problems, really, but everything depends on how your gear is packed. The chair lift or hike will lead you to “The Barrels”. “The Barrels” stands at ~3650m / 12000 feet and serves as a base camp. The alternative is to hike up to the “Diesel Hut” (used to be the “Prijut 11”- “Refuge of the Eleven”) at 4100m / 13500 feet and make it your base. If you do not come already acclimatized, you will need to spend a few acclimatization days before attempting the summit. Here potential controversy starts. Local entrepreneurs run snow cats up and down the mountain. They are excellent for skiing arrangements and for a fee snow cats take people up either to the Diesel Hut, or even higher, to the base of Pastukhov Rocks (4700 m / 15500 f). If you use a snow cat on your summit bid, is it a “real” ascent? In our party of 18 climbers, 5 didn’t want a cat, while others did. The route allows splitting in smaller teams, so the decision of others does not affect you anyway. We discussed the situation openly and the common denominator for everybody was that climbing was about stretching ones ability to the limits of what’s reasonable for that person and to celebrate what was achieved. Mind you, if you feel adventurous, you do not have to use the Huts at all. Camping is allowed virtually at any place where the terrain permits on the route from “The Barrels” to the base of Pastukhov Rocks. That is a great way to ascend to Mt Elbrus in a more private manner, while still using the conveniences of the Normal route. Another way to ascend Mt Elbrus is from the North Side. Here are no cable cars and snow cats and much fewer tourists. Expedition also takes longer (about 9 days) but is definitely worth it! The Base Camp is reachable by 4-wheel drive and lies at ~ 2500 m. From here you make acclimatization hikes to the High Camp (at about 3800m, similar altitude as “the Barrels”). The distance and elevation from the High Camp / the North Side and from “The Barrels” / the South Side to the summit is pretty much the same and it takes a long day. Some choose to have an interim camp in order to make the summit day shorter. You can also traverse from the North to the South or vice versa. If the South- North route seems boring – consider the Kiukurtliu route (South-West). You will be camping (no Huts there) and enjoying the mountain pretty much to yourself. The trek can start as low as the Azau sport base and duration of the trip will depend on previous acclimatization. Budget in 10 days to allow for bad weather. I’m not aware if guiding companies run commercial expeditions on this route. Ask if a tailor-made expedition is possible. 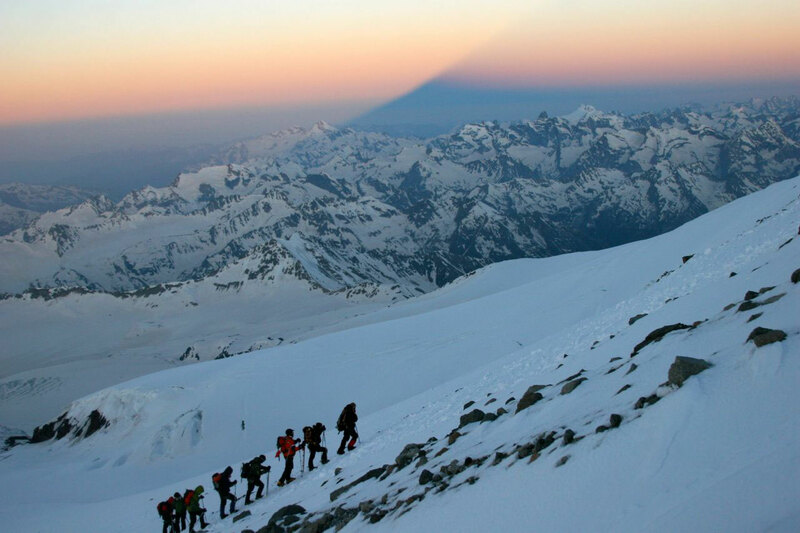 While locals often climb Mt Elbrus independently, being a foreigner complicates the matter. To cut the long story short – it saves a lot of time to hire a local mountain guide company and they will arrange all necessary permits and registrations, so you will have to concentrate on the climb itself. The local (and by “local” I mean Russian-based) companies have English-speaking guides and generally are “sane” and reliable. No need to bring a western guide with you. Added value – locals will be on the top of the latest rumors, political situation and any safety issues and will be in a better position to explain to you what’s going on. Periodically the Elbrus area becomes a hot spot, up to the level when all climbs are banned. Locals will have the latest update on the situation. Besides, a Russian company might be easer on your wallet.